1. This is our first tree together. In the past, we simply didn't have the space for a tree or we were always traveling for the holidays; so why bother with putting one up? We've amassed a somewhat kooky collection of ornaments over the years that we've never had the chance to display. 2. 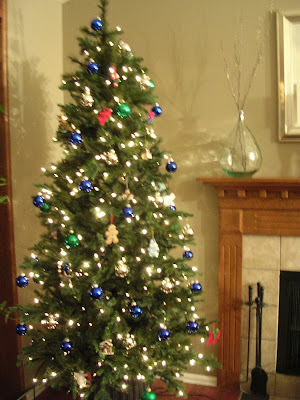 I grew up with Buddhist parents so we didn't own a Christmas tree. Thus this tradition/process is unfamiliar territory to me. 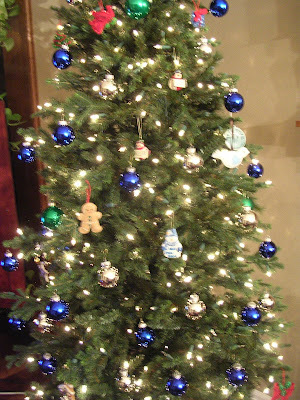 I decided to get festive and decorate the tree all by myself to surprise the Husband. So I opened the fresh box of shiny balls (*giggle, snort*) and began to hang them on the branches, terribly crushing each one in order to thread it through the tiny little loop that topped each ornamental ball. Well, this made the balls jut out at odd, awkward angles instead of "floating" delicately on the branches like I've seen. Huh, I thought to myself. Utterly bewildered, I peeked inside the box again to make sure I didn't miss something. Shrugging, I continued. Mr. FC saw the tree before I was even 1/3 of the way done and gave me a look that implied "You've finally sniffed too many renovation fumes." Him: Did you forget the little hangers for the balls? Me: What? What the hell? Am I supposed to make those? So, nobody told the Buddhist girl that she needed little loop hangers for those balls. Lucky for us we had a spool of wire handy.